With two days left in the month, I felt like I should update you guys with a video. Please ignore all my “ums”, ha! After replaying it for myself I decided to keep the video like it was. Thanks again from the bottom of my heart for all the support! HOLY COW guys! Go you! Go GOD!! But do you think we can FREE a SEVENTH woman?! Can we give her a new hope for the Holidays? Let’s rock the socks off of these last two days! Or maybe you’d like to help these women on their journey with a new job. The company fashionABLE is where it’s at. Not only will you be helping a woman get and keep a job, by making these scarves, but you my friend will have a GORGEOUS scarf of your own! Plus, it IS coming up on Christmas, maybe you buy one, two, or ten as a gift for friends and loved ones! What better way to make the holidays mean more?! AND be entered in a drawing to win a $25 gift card to the FAB stationary shop, Evolove Creations!!! 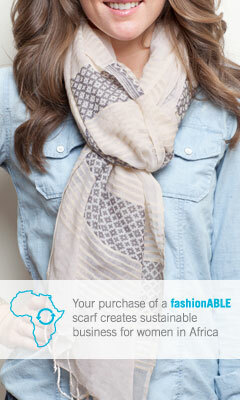 So PLEASE buy a scarf, or donate to help save a SEVENTH woman! FREAKING OUT!!!! Peeing my pants, crying my eyes out EXCITED!! I’m so blown away by what God has done through your faithfulness! So proud of you friend, you did AMAZING! Love you love you love you!!!!! man girl you blew it out of the water!!!!! so excited. so proud. so blessed. thank you!! !